For more than a century citizens of Columbia County have been privileged to conduct courthouse in the State of Washington. Columbia County separated itself from Walla Walla County in 1875 and became a county in its own right. Jesse N. Day, founder of Dayton, deeded the land for a courthouse. It was not until 1886 that authorization was secured from the Washington Territorial & the U. S. House of Representatives for issuing construction bonds for the territorial courthouse. Columbia County voters approved a $40,000 bond. Total construction cost came in at the lower amount of $38,069. The Columbia County Courthouse represents a period of political activity when county government played a significant role. In a period of rapid growth and limited contact with the state capital, people turned to county government as a source of authority. The most immediate needs of county citizens were handled in courthouses. 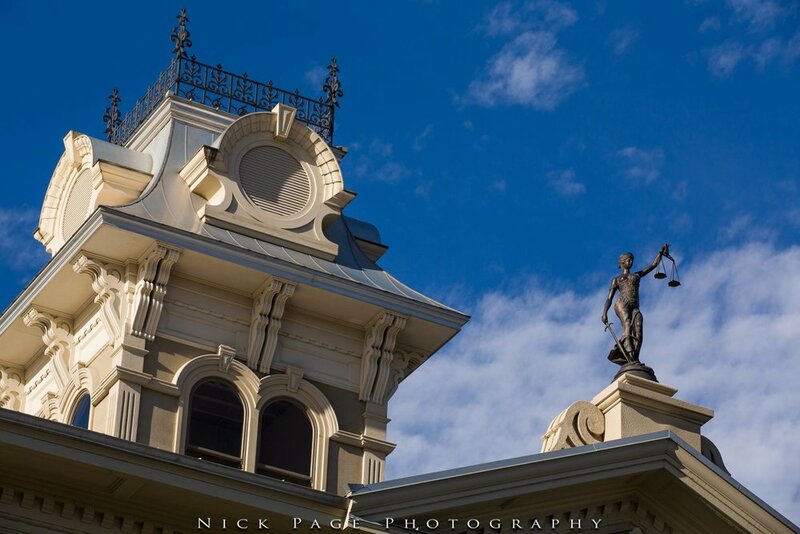 Community pride instilled a desire to establish a fitting structure, and the 1886 Italianate• style Courthouse was the result. Before construction, county offices were scattered around town, and court was held in a church. In 1915 George Wick, a Civil War veteran, was instrumental in acquiring two brass Mountain Howitzer cannons from the U.S. War Department that were used in the Civil War. These cannons were placed on the courthouse lawn. One of the cannons had been fired during the war but the second had never seen "active duty." One night, in 1917, three high school students fired one of the cannons. The report damaged surrounding windows and roofs, and the cannon itself flew into the air and landed facing the courthouse. The community raised money to help the culprits pay for damages. The "Cannon Boys" wrote an apology and a separate thank you note to the community that appeared in the local paper. The cost of the 1993-94 restoration was $1,800,000. $450,000 was raised by local fundraising and private grants, $660,000 was received in state funds, $140,000 was appropriated from ADA federal funds to cover the cost of the elevator, and $350,000 came from dedicated county funds.